Jason Fram scored with 6.5 seconds left to play in the third period as the U Sports all-stars edged Canada 4-3 on Thursday in St. Catharines, Ont. It took less than four minutes for Alex Formenton to show why he was brought to Canada's world junior selection camp. Working on the penalty kill, linemate Nick Suzuki pressured a U Sports player into coughing up the puck that bounced to Formenton. He took off down the ice and gave Canada a 1-0 lead 3:42 into an exhibition game against a team of all-stars from U Sports. Jason Fram scored with 6.5 seconds left to play as U Sports rallied for a 4-3 win on Thursday, but Formenton was still pleased with how he performed. "I think it was important to play well in my first game," said Formenton, who admitted the selection camp process was nerve wracking. "Obviously, you want to leave an impression. To get on the scoresheet certainly helps." It was the second of two games between Canada's national junior team and a team made up of players from universities across the country. 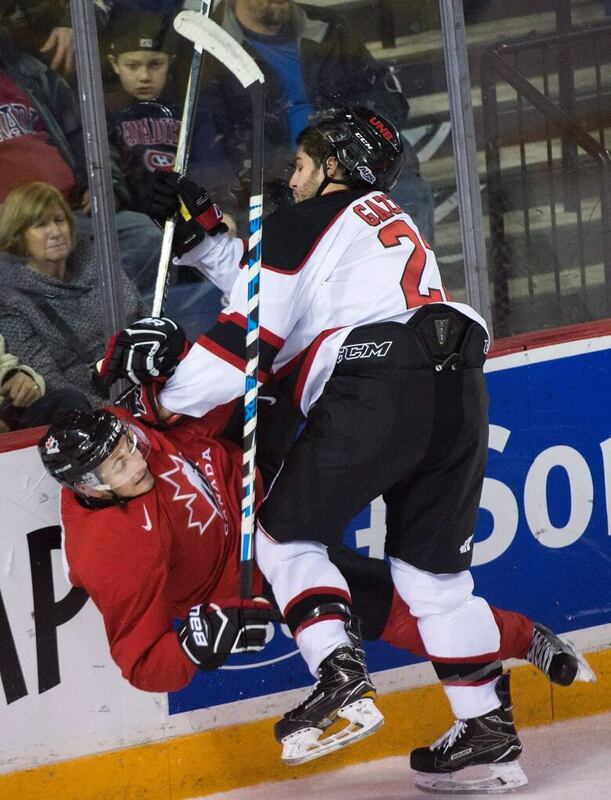 Hockey Canada used the two games to evaluate talent as part of its selection camp ahead of the world junior championship, Dec. 26 to Jan. 5 in Buffalo, N.Y. Following the game, six players were cut to reduce the number to 27. Defencemen Dennis Cholowski and Logan Stanley were sent back to their junior teams as were forwards Cody Glass, Kole Lind, Jonathan Ang and goalie Samuel Harvey. Canada plays Denmark in an exhibition on Friday at Meridian Centre with Hockey Canada expected to make its final cuts after to bring the roster to 22 — 13 forwards, seven defencemen and two goalies. Formenton believes his fast skating is what earned him an invitation to his first Hockey Canada camp and he was pleased that he was able to showcase it on the penalty kill. He also took it as a sign of faith from head coach Dominique Ducharme that he was put into a high-pressure position like killing a penalty. "I think using my speed is one of my biggest assets," said Formenton, a second-round pick of the Ottawa Senators this past summer. "Just using my speed on the forecheck and driving it wide." Cole Sanford scored twice for U Sports, with Spencer Abraham adding a goal. Kale Clague and Robert Thomas replied for Canada. All four of the goalies Hockey Canada invited to the selection camp played Thursday afternoon. Carter Hart started for the juniors and was replaced midway through the game by Colton Point. At the other end of the ice, Samuel Harvey started for U Sports and was relieved by Michael DiPietro. Hart stopped 8-of-10 shots in 30 minutes of work before Point made 15 saves. Harvey turned aside 13-of-15 shots and DiPietro stopped 11-of-12. 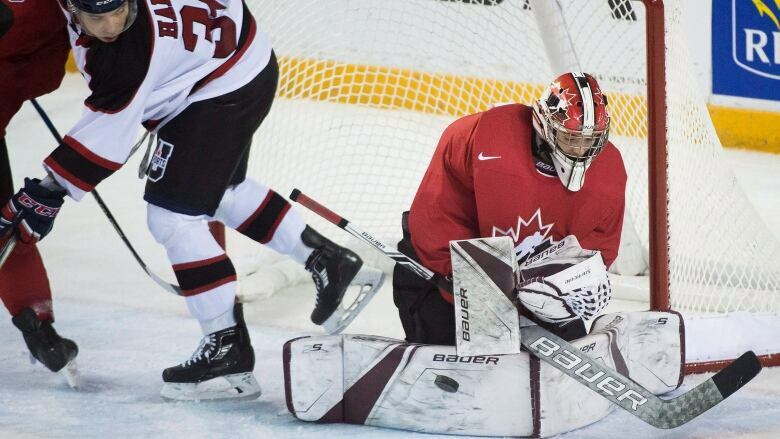 Canada lost to U Sports 3-0 on Wednesday with Point and Hart sharing a 32-save shutout. Ducharme was pleased with the tough competition the U Sports all-stars gave his team. "It was a tight game," said Ducharme. "That's exactly what we wanted to create, to see our guys facing adversity. It's perfect for our evaluation. "They're 23, 24, 25 (years old), so obviously if you get into a battle physically they're more mature. That's the kind of adversity we wanted so we could see how our guys handled themselves."